Okay, time for me to interrupt the melodrama over the word “melodrama” by posting a new blog entry! A little history: Unlike San Francisco’s Mechanics Institute, the Santa Cruz chess club is not fortunate enough to have a permanent location. 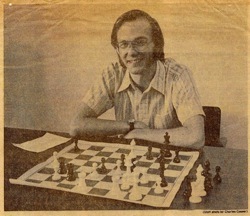 When I first moved to town, eleven years ago, it was the SCO chess club, named after and based at the company headquarters of the Santa Cruz Operation, a computer software manufacturer that no longer exists. We met in a classroom-type room that was located near a snack bar. The snack bar had a working soda fountain, so one of the advantages of meeting there was the chance to drink free Cokes! There were certain disadvantages, though. Because we met after business hours, the building was locked, so whenever anybody arrived they would have to knock and someone would have to getÂ up from their chess game to let them in. Eventually, around 2001, the company kicked us out because there were too many teen-aged kids in the club. As far as I know, the kids never did anything wrong, but the company was worried about liability in case, I don’t know, a kid hurt himself playing chess. It was pretty stupid, but in retrospect we wouldn’t have been able to stay at SCO much longer anyway. The dot-com boom collapsed in 2001, and as you can read in the Wikipedia entry that I linked to above, the company was bought out and the original company no longer exists. So for a year or so we met in the German-American Center in Santa Cruz. This was arranged by Gerhard Ringel, who had connections there. We had to pay rent, though, so instead of being free the chess club was now $1 or $2 a week. However, most nights this didn’t cover the actual rent, and Gerhard paid the rest out of his own pocket. This was a wonderful gesture on his part, but obviously it couldn’t go on forever. By the way, Gerhard is probably the closest thing to a famous person in our club. He is well-known in mathematics for his proof of the Heawood Conjecture, which tells you how many colors are needed to color any map on a non-spherical surface (e.g., a doughnut). Curiously, though he was a very accomplished mathematician, he was a rather average chessplayer. At an age of 82 years or so, he was a little too slow and cautious to compete with the club’s whizzes. But he was always a great gentleman. He doesn’t come any more, and I hope that he is still in good health. Fortunately, around 2002 a new Borders bookstore opened in downtown Santa Cruz, and the club found a new home there. Amazingly, Borders seems to be willing to tolerate our presence every Thursday night at no charge, as long as we don’t take up too much space in the cafÃ©. I guess we’re supposed to buy something while we’re there, but no one enforces this, and enough people buy a cup of coffee or tea voluntarily that the bookstore doesn’t complain. So for the time being we’re pretty stable. IfÂ any readers of this blog are ever in Santa Cruz, come to Borders around 6:30 on Thursday to play chess! The format of the chess club, ironically, has never changed since the SCO days. We split up into quads (the lowest-rated quad may turn into a quintet or sextet) and play three 25-minute games a night. However, this wasn’t the end of the game.Â Many playersÂ would have resigned after White’s combination, but Steve has a hustler’s approach to chess — there’s no value in resigning because something strange can always happen. And this time, something strange almost did! About 50 moves later we got to a position where I was totally winning, with a rook, knight and four pawns against Steve’s bishop and knight and no pawns. But I had only a minute and 9 secondsÂ left. I made my move, and then Steve sat and thought. “Okay, maybe he’s finally going to resign,” I thought. HeÂ pondered a little bit longer. “What’s he thinking about?” I wondered. It just wasn’t like Steve to spend so long over his move when he’s trying to blitz me in time pressure. I looked over at the clock… and horrors! My clock was still ticking, and it was down to 18 seconds! Somehow I had missed the button after making my last move. Quickly I pressed the button, and Steve made his move, and fortunately the game was so completely won that I was able to checkmate him in less than 18 seconds (in fact, less than 10 seconds). Whew! I’m so glad that I happened to look at the clock just when IÂ did. I can only imagine what was going on in Steve’s mind as he watched my clock tick. “Just a few more seconds… just a few more seconds… !” But of course, he couldn’tÂ move or breathe or sayÂ anything. In the end, he was undone by the fact that he’s a good speed chess player, so I knew something was fishy when he took so long over a meaningless move. By the way, some of you might feel guilty about winning a game because your opponent missed the clock button. But I know for a fact that Steve would not feel the least bit guilty! As I said, he has a hustler’s mentality, and for him,Â a win is a win. Solution to diagram. White does a neat little two-step with the bishop: 17. Bc5+ Nge7 18. Ba7! Black can’t take on a7 because of 19. Rd8 mate. The game actually continued 18. … Bh6 19. Bxb8 Nxb8 20. Rd8+ Kg7 21. Nxh5+ Kh7 22. Nf6+ Kg7 23. Rxh8 Kxh8 24. Nxg4, and White has won an exchange and three (!) pawns. A fitting punishment for Black’s lack of development and his overeager push of the g- and h-pawns! 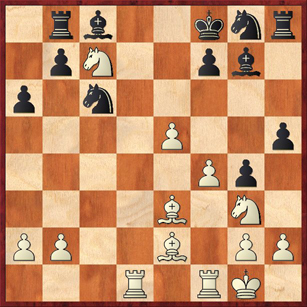 Because Dana had been kind enough to tell us that there was an exchange to be won, I immediately focused my sights on removing the defender of a7, the Knight at c6. After ineffectually glaring at it for the better part of five minutes I gave up; I peeked. I mean it was late at night, I was tired and (here insert long list of excuses at your discretion). Did I look at the Bishop check? Yes. Would I have played it even unaware that it leads by force to winning an exchange? You betcha. Why? Politically correct answer: always give your opponent the opportunity to go wrong, he might cover the check with the c6 Knight and I would play Rd8 mate. Stark, brutal reality: I would have given the check as a sort of Nietzschean will-to-power thing; I would have checked because I love to check, because its our code, (patzer sees check, patzer gives check), because opportunity knocks but once. Check! There. After opponent had covered the check with the g1 Knight would I have seen the winning combination? I donâ€™t know, but just for the sake of argument suppose I would have, seen the winning combination, I mean. This assumption would lead us straight into the perilous waters of what gives with playing the right move for the wrong reason, doing the right thing for the wrong motive. Dribbling, you actually make me feel better, because I did not see this combination right away, either. I think that what makes it difficult psychologically is that you usually think of a combination as involving two different pieces. To move one piece and then deliberately move it again seems like a waste of time. This combination falls in the category of what I like to call “moving your opponent’s pieces.” White would like to deliver mate on the back rank. The problem is that Black’s king has a flight square on e7. So, why not induce one of Black’s pieces to occupy that square? I think you should at least get partial credit for playing 17. Bc5+ even if you didn’t see 18. Ba7, because 17. Bc5+ is clearly a strong and forcing move. In fact, if you put this position on a computer, it says that 18. Nd5 is an even stronger followup than 18. Ba7! One point is that Black can’t unpin the knight with 18. … Ke8 because 19. Bxe7 Nxe7 20. Nc7+ leads once again to mate. Strangely enough, we have the same theme of “wasting a tempo” in order to move the opponent’s pieces around, only this time we’re doing it with the knight! If for some reason 18. Ba7 had not been available, would I have figured out the alternative move 18. Nd5? I dunno. Obviously it’s always better to have a plan, but even so, there’s something to be said (especially in 5-minute chess or 25-minute chess) for playing a strong and forcing move like 17. Bc5+ and just assuming that something good will come out of it. We should mention that Jim Parker is the one running the club in Borders. how does the rating system go there is the club reconized by the uscf, yet. and how does the tournment work out there?